Peanut Butter Fudge Puddles that are the perfect cookie for Christmas or any holiday cookie tray. 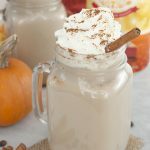 I make these for dessert all year ’round! I have never made fudge puddles before but they have been on my radar for a while now as I knew they would make for the perfect Christmas cookie. I was right! 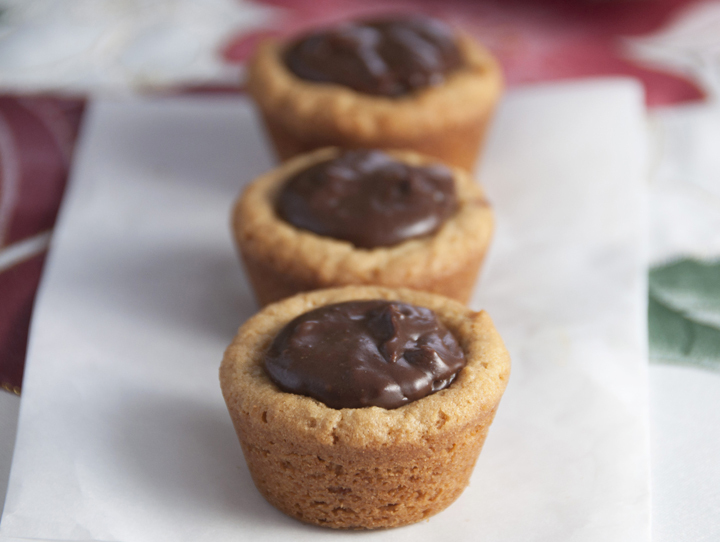 I very highly recommend these cookie cups.Tthey are not only delicious, but extremely visually appealing, as well. They look so fancy and like you spent a lot of time making them, when they were really very easy and required very little effort. The chocolate fudge center melty, very rich and just plain awesome. I wanted to eat the fudge filling with a spoon! I may have done that, but don’t judge me. Also, the peanut butter flavor doesn’t stand out too much, but that could be a good thing depending on your taste buds. I like a lot of peanut butter, this these fudge puddles had just the right balance of peanut butter and chocolate. 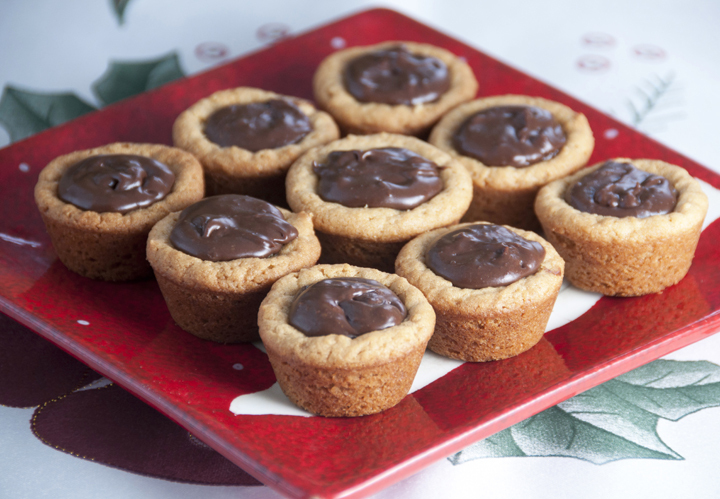 So, what are your favorite cookies to make for the holidays? If you can squeeze in one more round of baking before Christmas day, squeeze these in. I can tell you one thing – these will become a staple in our household, and not just for Christmas. Nope – I’ll be making these babies all year ’round. Gooey Chocolate Peanut Butter Bars – I love how soft and chewy these bars came out to be! Peanut Butter Buckeye Bark – this bark is no-bake and a dream for your sweet tooth! 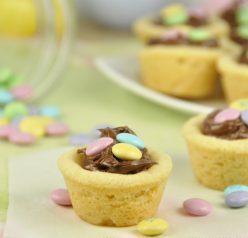 Note: If the chocolate filling gets a little thick, microwave for 10-15 seconds and it should loosen up enough for you to resume filling the cookie cups. Peanut Butter Fudge Puddles are the perfect cookie for Christmas or any holiday cookie tray. I make these for dessert all year 'round! Cream butter, peanut butter and white and brown sugars. Mix in egg and ½ teaspoon vanilla. Stir the flour mixture into creamed mixture. Shape the dough into 48 balls, 1 inch each. Place each ball in one compartment of a mini muffin tin. For filling, put chocolate chips in a double boiler over simmering water. Stir in milk and the other ½ teaspoon of vanilla, mix well. Bake for 14 to 15 minutes or until lightly browned. 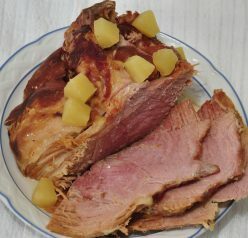 Remove from oven and immediately make wells in the center of each using a melon baller or backside of a tablespoon. Cool in pan for 5-10 minutes. Then carefully remove to wire racks. Using a measuring cup fill each well with the chocolate mixture. Optional: top with a pecan or sprinkles for a different twist. HAHAHAH this made me laugh out loud!!! The title grabbed me with name fudge! Oh mama..
LOL fudge is a very grabbing word, for sure! Oh my…that chocolate looks so good!! I love the combination 🙂 I’ll definitively be adding these to my cookie list. Thanks! Oh, I like this idea! Fudge on its own is just so rich sometimes. I like that there’s a starchy base here. I’ve never made this kind of cookie…and they sure do look sensational. I want to dive right into that center! What a delicious treat! You can never go wrong with peanut butter and chocolate. Yes, I’d have to say these are the perfect Christmas cookies…but really, the any time kind of cookie. LOVE pb…so these are being pinned! Thanks for the pin, Gloria!! Ashley, these look like so much fun to make as well as eat! I just adore anything chocolate the PB! Perfect for Christmas cookie trays. Thanks for sharing, girl! Dina, thank you so much! Chocolate and peanut butter? Sign me up, these loook lovely! The recipe peanut butter fudge puddles calls for 1/2 teas vanilla then 1 teas vanilla but when putting it together you only use 1/2 teas in peanut butter mix . Then you use 1/2 teas in chocolate mixture . So there is a 1/2 tsp lefted . So is one of the steps wrong ? hi Jo! Half a teaspoon goes into the peanut butter mixture and 1/2 teaspoon into the chocolate mixture to equal 1 teaspoon total. Hope that helps!! The ingr. list has a typo, Ashley 🙂 Should be 1/2 tsp twice, not 1/2 + 1. I’ve never heard of fudge puddles! Where have I been? I need these in my life. 🙂 They look deeeeelicious! You will love these, Tina! Oh my yumminess! I’m obsessed with the pb/chocolate combo, so these are definitely calling my name! Pinned and can’t wait to try them! These are looking so good! Hi, Becky! It is included in the instructions (#4). I just call it “milk” which is maybe why you overlooked it. Thank you!! Do you just heat the choc. chips and milk until it is melted? or let it cook for so long? would putting it in the microwave work for this step? Yes I heat it up in a double broiler until melted. You can use a microwave but just be careful not to scorch the chocolate or it will seize up! Could you press the raw dough in the small muffin tins to make the crust or is it a must to bake first and then press dough while warm? These do look soooo delicous! You can press the dough in first, it will just make the cups a little bit of a different shape (less rounded) but I have done them that way before when I was recipe testing. Hope that helps!! Sue, I’ve made this recipe a zillion times and it comes out perfectly ever time (I double and triple checked the ingredients/directions). Did you bake them in a mini muffin tin as the directions state to? There is no way they can even possible come out flat if you did that. There’s no room for the balls of dough to even spread like a cookie would. Did you use enough flour? 1 and 1/4 cup? Sue, I completely understand! I have that happen sometimes too and it stinks!! Don’t worry about it. I just wish we could figure out the problem here, that’s all. Ashley I used a 24 cup tin,should I have used a 48 cup tin? Hi Sue – no, mine is also a 24 cup tin. I have no idea why this happened to yours! 🙁 You’re sure you used enough flour, right?